Bespoke protective covers for both PadFone X mini and PadFone X mini Station that are designed to work together, even when the phone is docked. PadFone X mini with a snap-on Side Flip Cover can easily slip into the PadFone X mini Station without the need to remove the Side Flip Cover. The PadFone X mini Station TriCover is foldable at an angle that is optimized for watching movies or reading on the landscape mode. Intuitive and easy to use! Protects your screen and minimizes scratches, scrapes, and dents. 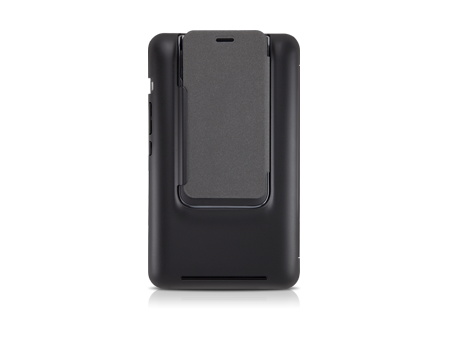 Case features a soft microfiber inner cover and a durable polyurethane outer cover for maximum protection. PadFone X mini Side Flip Cover replaces the existing back cover as a snap-on replacement. Intuitive and easy to use! PadFone X mini Station TriCover is a foldable cover that allows you to position the PadFone X mini Station at an angle that is optimized for watching movies or reading on the landscape mode. Securely fastens onto the base of your PadFone X mini Station. Easy access to the various ports. PadFone X mini folio bundle undergoes a series of durability tests, which include paint abrasion, resistance to impact, extreme temperatures, humidity, and solvents. The inner layer is made of a fine microfiber cloth that keeps the screen safe from scratches and scrapes.